UK: Does Halal meat mean 'animals are dying in pain'? You are here: Home » Regional news » Europe » UK: Does Halal meat mean ‘animals are dying in pain’? UK: Does Halal meat mean ‘animals are dying in pain’? 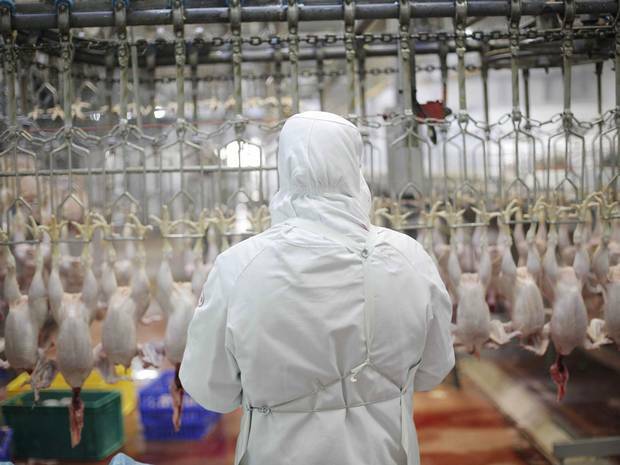 British Muslims are divided over whether pre-slaughter stunning is a legitimate practice. But the study concluded that it is increasingly being considered forbidden. Researchers at the School of Veterinary Science found that 69 per cent of Islamic scholars who were questioned said they didn’t think stunning prior to slaughter reduced an animal’s pain. Fifty-nine per cent of halal consumers believed the same. The report which was published in the journal Meat Science said: “The lack of understanding of stunning among some scholars has resulted in the issuance of confusing fatwas [religious rulings] on the suitability of stunned meat for consumption by Muslims. Ninety-five per cent of Islamic scholars questioned said they thought stunning would be acceptable under “halal” rules if it could be proved that the act did not kill the animal. According to Islamic rules an animal must be alive at the point of slaughter. EU regulation states that animals must be stunned when killed but the UK has an exemption for meat for Muslims and Jews. Researchers in Bristol behind a study into the way animals are killed for halal meat insist they never accused Muslims of ‘ignorance’. A team from the University of Bristol researched the views of Islamic scholars over stunning animals before they are slaughtered. They asked whether stunning was allowed before halal slaughtering, which involves a religious verse being said as the animal’s neck arteries are cut and the blood drained. The study concluded some scholars showed a ‘lack of understanding’ and believed pre-slaughter stunning would mean meat was not halal. But the researchers have hit back after some newspapers, including The Times and MailOnline, said ‘Muslim ignorance’ caused animal suffering. A member of the study team, speaking anonymously, told the Independent the term ‘Muslim ignorance’ was never used. The study said: “The lack of understanding of stunning among some scholars has resulted in the issuance of confusing fatwas on the suitability of stunned meat for consumption by Muslims. “There is an urgent need for these scholars to be given theoretical and practical education on stunning and other modern slaughter techniques such as mechanical slaughter. It found that nearly half of consumers surveyed (47 per cent) said stunning animals, even if it did not result in death, would not constitute halal. More than 95 per cent of Islamic scholars did say stunning was allowed during the halal process. But 69 per cent of scholars disagreed that stunning before slaughter reduced pain felt by animals. One researcher said the conclusion of some papers that ‘ignorance’ was causing animals to ‘die in agony’ was ‘insulting to Muslims’, the Independent reports. Failing to stun animals before slaughter has been condemned by a number of organisations, including the British Veterinary Association.